The MaxPass at Disneyland is the ticket to multiplying the fun of your Disney experience. Discover the tips and tricks to maximize your time as you go to and from experiences at Disneyland park. Disneyland recently revamped its free FASTPASS system, which is still in place, and introduced an optional, paid service called Disney MaxPass. How much does the MaxPass cost? The MaxPass costs $15 a day per person per day. It allows every person who has one to go to the fast pass of every ride and also give you access to photo PASS. You do not have to buy the MAXPass for everyday of your trip. I would suggest purchasing one the first day and decide whether or not you feel like you have gotten enough rides in for the day. If you decide after the first day that you want to add the MaxPass to your ticket the next day you can purchase it same day. How do I reserve fast passes once I have purchased my MAX pass? You will want to download the Disney app that will allow you to access wait times, show times, character locations, and your fast passes. You can reserve a fast pass for different rides at the same time in different parks. We had park hopper passes and loved being able to hit our favorite rides and shows regardless of where we were earlier in the day. This made the experience really easy to pick and choose what we wanted to do based on wait times and opportunities available in the park like parades and night shows. You’ll be able to see all passes and activities that are available for a fast pass and this will help you to plan your day and figure out what things you want to do. *90 minute window for riding the ride. *unlimited number of fast passes you can do in a day, you simply need to do one at a time. *reserve your night time show as soon as you scan your pass in for the day. *free photo Pass access for both parks and access to professional photographers and their mad skills! I regret that I didn’t take advantage of this more…we had so much fun with our photographer and he caught some truly magical moments in a few short minutes. It was so nice to not have to worry about asking someone to take a picture of us with our phone and the pictures are such high quality. If you are visiting as a family or a group you can upload all of your tickets by scanning your bar code to your phone. This will be considered your FastPass “Party”. 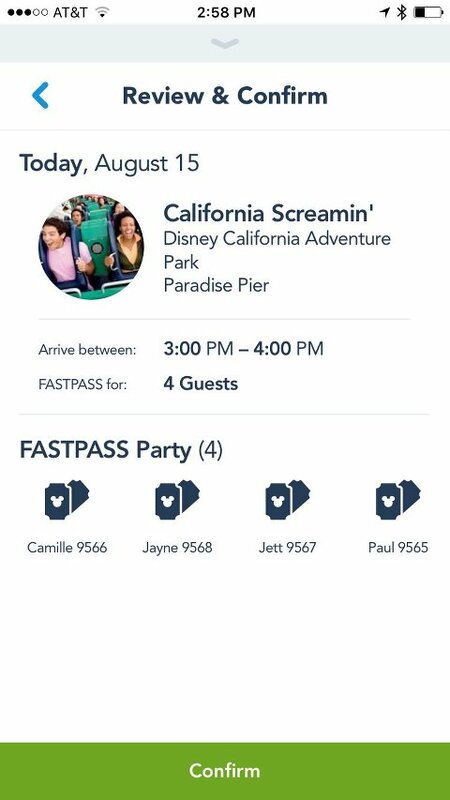 You can also scan your tickets to more than one phone, which means you can split up as a group and still have access to reserving your own fast passes together or separately. Keep in mind that you will definitely want to bring an external charger, or two. I like to have one pre-loaded, and if possible bring an extra that is solar powered! Another good idea is to bring a plug so that when you stop to eat you can recharge your battery or your external charger. How often can you reserve a fast pass on the MaxPass? You can reserve a new fast pass every 90 minutes. This does not mean that you cannot reserve more than one fast pass if you have one reserved that is later in the day. But you can only reserve a new one every 90 minutes. It is a great idea to set a timer on your phone or have someone in your group keep tabs on the time so that as you are waiting in line for another ride you are reserving your next fast pass after you have scanned your tickets. There is no limit to how many fast passes you can have lined up, just be familiar with the walk time needed to and from rides as you go throughout the park. Typically you cannot get on the ride earlier than the allotted time, but each ride operator is a little bit different. I would suggest to show up during your allotted time and keep reserving as you wait in line for the line up of your day. Which rides should I reserve on my MaxPass? Identify early which rides are a MUST for you. If you time it just right you may be able to do some of your favorite rides a couple times within the day. Not every ride has a MaxPass available, like Peter Pan. Peter Pan always has a long line, so if this ride is a must for you I would suggest you go to this ride first thing in the morning! If you do not like any of the rides that require a FastPass, then the MaxPass will not be of much value to you. What if the ride breaks down or closes during my return window? This could very possibly be one of the best scenarios! Disney always makes this better, and if this should happen to you, you will have the opportunity to use your FASTPASS turns into a Multiple Experiences pass. The new pass automatically pops up on your phone with balloons and allows you to take this FASTPASS to ANY RIDE that offers FASTPASS in that same park. 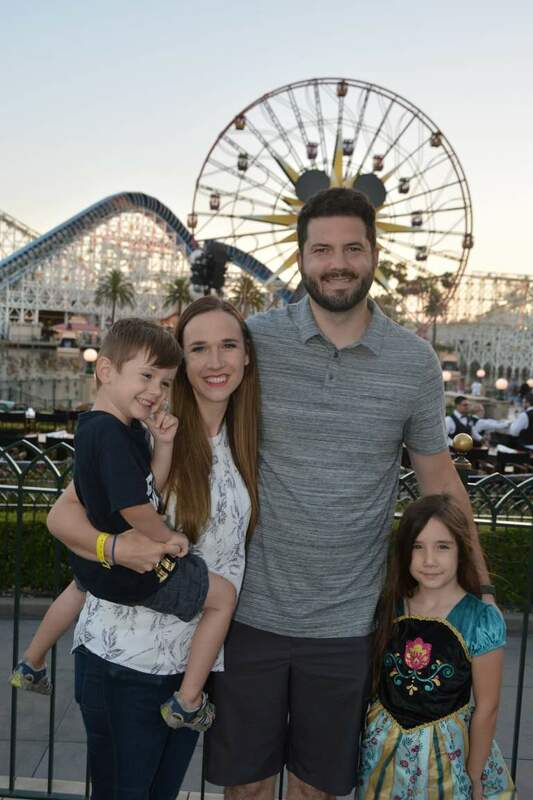 California Adventure: Cars ride, Incredicoaster, Guardians of the Galaxy. Secondary Fast pass options that are good to fill in the time are: Pirates of the Caribbean, Buzz Lightyear Astro Blasters, Star Tours- The Adventures Continue. You do not have to have a MaxPass to enjoy fast passes, but you do need to download the Disneyland app. ***One added bonus is that if for some reason you are unable to use your fast pass because of a ride being unavailable or a ride breaking down a cast member will often give you access to a fast pass you can use on any ride in the park. This must be claimed in the same park and used by the end of the day. Not all rides offer fast passes, here are the rides that have the fast pass available. Make sure that when you go through the ride whether you are using the MaxPass or not that you get the rider SWAP pass. This has to be requested before you ride the ride. I have gone through the line and forgotten until the end and technically they are not supposed to give it to you unless you ask them before. How Does the Photopass work? This is one of the best kept secrets of the MaxPass. You can have access to every spot that has a photo opportunity with one of the Disney cast! Make sure to take the time to get a professional photo in front of the castle, in Radiator Springs, the dock of California Adventure, Tomorrow Land, and any other spot that photos are taken. If you happen to catch a cast member photographer who isn’t busy at the moment they are more than willing to take some creative, fun pictures for you! They are Disney employees and creative and fun!! Take advantage of the opportunity and do some fun pictures that you can treasure forever. You will also have access to all the photos that are taken on rides! They will be downloaded directly to your app, but you need to make sure that you download the QR code that is available just as you get off the ride. The codes are available to type into the app so you can have access to those pictures as well. You can have pictures from Splash Mountain, Space Mountain, Incredicoaster and more! These pictures are some of my favorite so don’t forget to snag them when you can! EXPERT TIP: Take a screenshot of your QR code for your PhotoPass so that you are not running out your battery searching for it every time you have your photo taken. A quick trip to your photos and you can have the Disney photographer scan your photo. You do NOT have to be in the app to activate the code. The pictures will then be available through the app in which you can download directly to your phone and share on social media right away! Keep your eye on these photos and make sure you download them because they are only available for 90 days. These pictures are all high resolution and the best option for printing especially if you are wanting to make a large print to keep as a memory forever! If you do decide to purchase the fast pass try your best to use it on a day that you can get the most out of it as possible! Mid week days are the slowest and typically ones that you can get the most bang for your buck. Maybe you’re only going to be in Disney on the weekend and it will be even busier, so it would definitely be worth your while to use the MAX pass to get in as many rides as possible. What are the downsides of getting the MaxPass? The MaxPass can be a major drain on your phone battery. There are things you can do to reduce the amount of battery being drained from your phone, but make sure you invest in a portable battery charger. You can purchase them at the park for $30, but I would suggest bringing your own! Put your phone on low-power mode, you can also increase the life of the battery by reduce the drain on your battery by reduce the screen brightness. Use a portable battery charger or battery phone charging case. I love this one, and I also really enjoy this solar powered charger that can keep re-charging through the day. Charging lockers are available around the park for $2 an hour. I don’t really like the idea of using these as you most likely need your phone, but this could be a good option while you are eating lunch and not needing your phone. Take a screenshot of the FASTPASS and use the photo, which saves you from opening the app. Limit the times your searching for things aside from reserving the park tickets. Restaurant reviews, character locations, and other random searching should be done another time. Ask someone else who is not reserving the passes to be the official photo taker of moments in the park so that you’re not using your phone for all the things. As you can tell I am a big fan of the MaxPass! 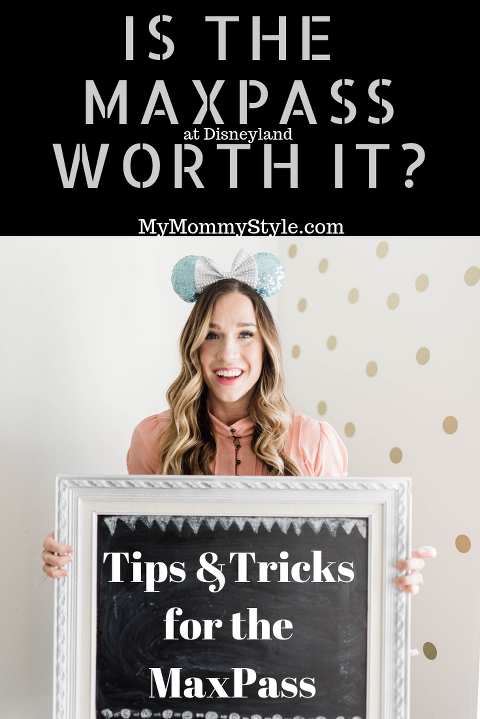 Taking a trip to Disneyland or DIsneyworld soon? Get the best price with Get Away Today! They promise to beat any price you can find online. Use the code: MommyStyle10 for an additional $10 off your package. I prefer to call so that I can speak with one of the specialists to workout which package fits our needs best. You can reach them at 1-866-GET-AWAY. If you are interested in booking a stay with Disney, you can find more information HERE. Is the MaxPass worth it? At the end of the day I think it is best to try the MaxPass for at least a day and decide if you think it is worth the extra cost. Consider if you are going to be in the park for a day or two and need to fit things in in a shorter amount of time. Definitely give it a go! If you have a week and can spread it out or you have younger kids and you don’t need to worry about the rides with FastPasses being long lines then maybe its not for you. Let me know if you know if you have any other tips in the comments below! Give the Max Pass a try, I think you’re going to love it! This post was written in partnership with Disneyland, all opinions are my own. Access a special Discount with Get Away Today! You can call 1-800-GET-AWAY for one on one consultation for your trip. You can save up to $500 on your package deals and add MommyStyle10 to get $10 off your package.